The much-awaited trailer of Dhadak released today and just like most of us, Bollywood celebs are also going gaga over the trailer and we are not just talking about the members of the Kapoor clan. Karan Johar's protégés Alia Bhatt and Varun Dhawan had interesting reactions on the trailer of Dhadak. Alia described the trailer as "pure magic" and wrote: "Make way for these two sparkling actors. Janhvi (Kapoor) and Ishaan (Khatter) are pure magic in theDhadak trailer and my dear friend Shashank Khaitan (film's director) you are just the best. I am so excited for this one and if I may say so...super proud if you." Varun, on the other hand, shared the trailer and tweeted: "Here it is Shashank Khaitan's Dhadak. This film is going to be amazing and Janhvi and Ishaan totally light up the screen. So proud of your journey Shashi, this is your best film." Shashank Kahitan directed Varun and Alia in Humpty Sharma Ki Dulhania and Badrinath Ki Dulhania. Varun, who also made his Bollywood debut with Karan Johar's Student Of The Year wrote: "Karan Johar makes films from the heart and Dhadakshows that." Check out Alia and Varun's tweets here. Toilet: Ek Prem Katha actress Bhumi Pednekar also had a sweet message for the Dhadak team. She wrote: "Welcome to this crazy beautiful world Janhvi and Ishaan. You both are so good. Loved the trailer, can't wait." Here are some other posts from Bollywood actors. It wouldn't be wrong to say that Dhadak's trailer is viral already. The trailer has received over 3.1 million views on YouTube within a few hours. Earlier this afternoon, Shashank Khaitan released the trailer and shared it on social media. Dhadak is the Hindi adaptation of Marathi film Sairat. 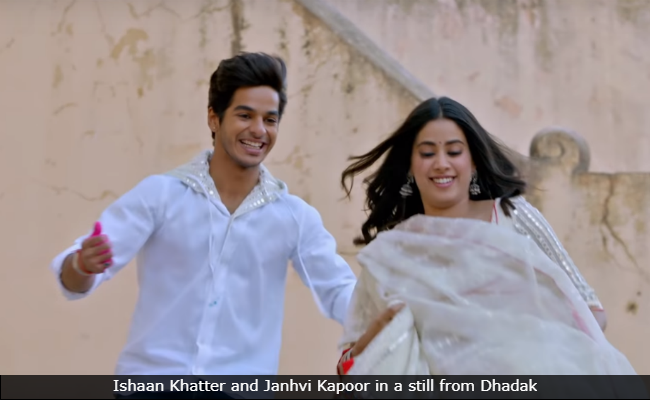 The film features Janhvi Kapoor and Ishaan Khatter in the lead roles and has been produced by Karan Johar's Dharma Productions. Dhadak will hit the screens on July 20.